A soapstone sink makes a stylish addition to almost any design theme from rustic country to contemporary sleek. But is it the right choice for you? Soapstone is extremely versatile and durable and has been used for centuries around the world to fashion fireplaces, tools, carafes, vases and... sinks. You may remember seeing one in your high school chemistry class where soapstone sinks and counter tops are commonly used for their excellent resistance to heat, chemicals and staining. In colonial America soapstone sinks were very common. Several popular styles developed such as... the "Boston-Williams" which is a rectangular single-bowl sink and the "New England Double-bowl" featuring two equal size sinks. You can buy these and other pre-made styles from several suppliers around the US or... you can have a sink custom made. 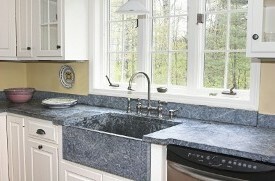 If you have a fancy idea for your kitchen or bathroom sink, bar or laundry room even... soapstone gives you many options. You can get a notched front, sloping farm-style front, built-in backsplash, single-bowl, double-bowl, off-set bowls, round or a "block" sink cut out of a thick chunk and installed as one huge piece... very cool and stylish. Depending on where it is quarried, the colors and qualities of the stone will vary. Typically untreated soapstone is a light gray-green, but some varieties have white veining like marble or a wavy pattern with movement like granite. The color darkens naturally with age or with applications of mineral oil. It is not necessary to apply mineral oil, but many people like the "wet and shiny" look you get with it. Soap and water will work just fine. Using a spray de-greaser will not damage the sink in any way, but it will remove any mineral oil faster requiring more frequent applications. A soapstone sink is generally more (sometimes waaay more) expensive than a similar sized stainless steel or ceramic sink. For a kitchen sink, expect to pay between $350 for a basic single bowl up to $2000 for more elaborate designs. Also adding to the overall cost are the extra modifications necessary during installation. Soapstone is heavy so additional bracing is needed. Existing plumbing may need changing since the overall size is much larger and specialty cabinets may be required depending on the design of your sink. But heck, you only live once right... so if you don't mind the price tag, a soapstone sink looks and feels great and lasts forever.